Cleverly-named SeeSaw is a new catch-up TV service with content from the BBC, ITV, Channel 4 and Five. While much of the content is already available on the respective broadcasters’ own on-demand services, it’s nice to have everything in one place. The site boasts a slick user interface that’s a pleasure to use, and I found the picture quality to be very good with no buffering problems to speak of. Clearly the site has to make money somehow, and in SeeSaw’s case it’s through video advertisements embedded into the programmes you watch, something that commercial TV viewers are used to seeing. 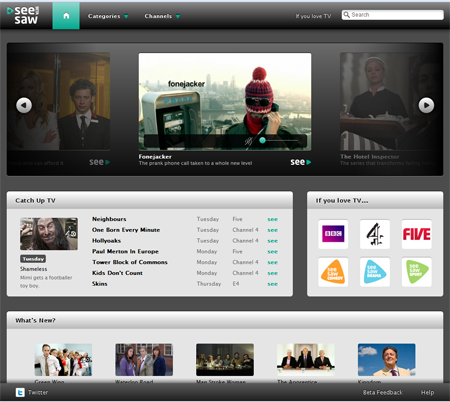 SeeSaw have future plans to licence programmes from a wider range of broadcasters, which will enhance the service’s appeal. Interestingly a TV licence is not required to use on-demand services such as SeeSaw – you are only legally obliged to buy a TV licence if you watch broadcast TV. I just stumbled across a great blog, Cover Lay Down,which features folk-style cover versions of popular songs. Highly recommended, although if you’re anything like me you’ll be there for hours! New legal music download service We7 offers free, non-DRM MP3 downloads from a number of popular artists. The catch? Each track has a 10-second advertisement tacked on to the start. A month after downloading an ad-supported track, you are able to go back to the We7 site and download a version with the advert removed. However, I downloaded two test tracks and found that the advert can be removed easily through the use of simple audio editing software. A very interesting business model indeed… only time will tell whether it is ultimately successful. GooSync is a service which allows you to synchronise your Google Calendar with your mobile phone or PDA. Unlike Google Calendar, which is only accessible via your mobile device’s web browser, GooSync ties in with the calendar/reminder function provided as part of your PDA or phone. This could potentially save you a lot of money if, like me, you’re on a fairly meagre data plan and like to check your schedule regularly. GooSync is provided by Wolverhampton-based Toffa International, who specialise in sync software. The basic service is free to use, while power users may benefit from the Â£19.95/year subscription account which offers additional features such as multiple calendar support. I signed up for the free service with the intention of writing a review, but to be honest there’s not much to be said. I signed up for the account, clicked the confirmation link sent to my email address, authorised GooSync to access my calendar via Google’s API and requested an auto-configuration message to be sent to my handset (Sony Ericsson W880i) via SMS. Opening the configuration SMS prompted me to install the new sync settings, then it was just a matter of telling the phone to synchronise. Zamzar is a free online converter for documents, audio and video files. Just upload the file you want to convert, choose the output format and enter your email address. Zamzar will get to work and email your converted file when it’s ready. Red Dodo: offers free personalised screensavers/animated wallpapers suitable for most popular phones. Quite a snazzy little service, I think. GetJAR: free applications to add functionality (or just fun!) to your handset. Lasyk Networks (for Sony Ericsson handsets): software, ringtones, wallpapers, games and more. who.is is a simple web-based WHOIS gateway, supporting pretty much all top-level domains. In case you didn’t know, WHOIS is a mechanism of finding out who (if anyone) has registered a particular name. It’s fairly quick, has a nice clean design and negates the need to go to separate sites for different domains. There are alternatives out there but the short, memorable URL and the ability to do quick lookups using only the address bar (e.g. who.is/chrisbarnes.net) makes it my favourite by far. What I’d like to see is some sort of independent service that mashes up the data from all 5 sites and helps you decide which network is best for your needs.